Batman and the Joker Jewels from Playtech is another homage to the caped crusader’s early days. It draws heavily on the aesthetic of the original 1960s TV show starring Adam West and Burt Ward. Fans of these first adventures will certainly enjoy this machine, as will those who are ethe line betited by the thought of playing for a lifechanging sum of money in the form of a progressive jackpot. That said, if you’re more interested in varied gameplay and second screen bonus rounds, perhaps Batman and the Joker Jewels will be less appealing. 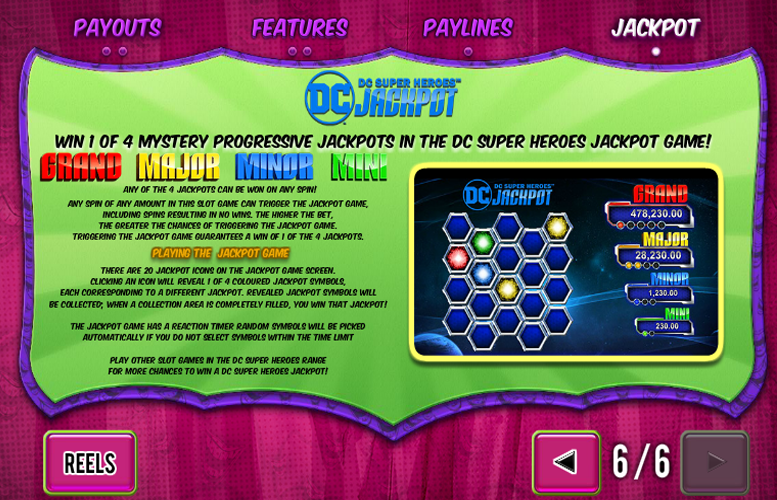 It only offers a free spin mode and occasional extra “wild” symbols on top of the progressive jackpot. Whilst these will be enough to keep fans of the franchise entertained, they’re unlikely to provide those unfamiliar with the original content with much ethe line betitement. High main game prizes. We love slots that have top prizes of over 1,000x the line bet and there are two ways of trigger such a substantial prize in this base game. Progressive jackpot. Winning a life-changing sum of money from a slot machine is what it’s all about, right? Niche appeal. You’re probably going to have to enjoy the original Batman franchise to get some enjoyment from Batman and the Joker Jewels – unless you hit the progressive jackpot that is! Lacks variation in bonus games. Unfortunately, there is no true second screen feature, the omission of which limits replay value. “Wild” Joker Mouth or Bat Symbol = 2,500x the line bet. Batman = 500x the line bet. Joker = 300x the line bet. Robin = 200x the line bet. 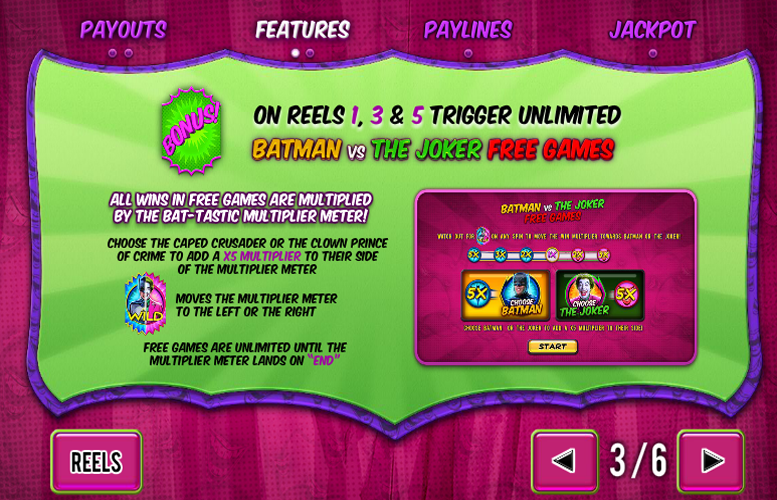 Landing the “Bonus” symbol on reels one, three, and five simultaneously will trigger unlimited Batman vs The Joker Free Games. During this round, all wins are multiplied b the “bat-tastic” multiplier meter. 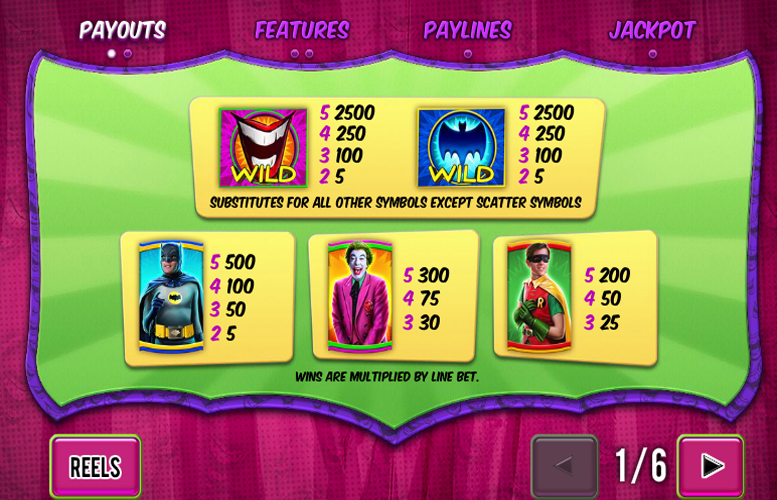 Players must first choose Batman or the Joker to add a 5x multiplier to their side of the meter. Landing either of the special “wild” symbols will move the multiplier meter to the left or the right. The free games will continue until the multiplier meter lands on “End”. This feature can be triggered on any main game spin. As the name suggests, it occurs randomly. 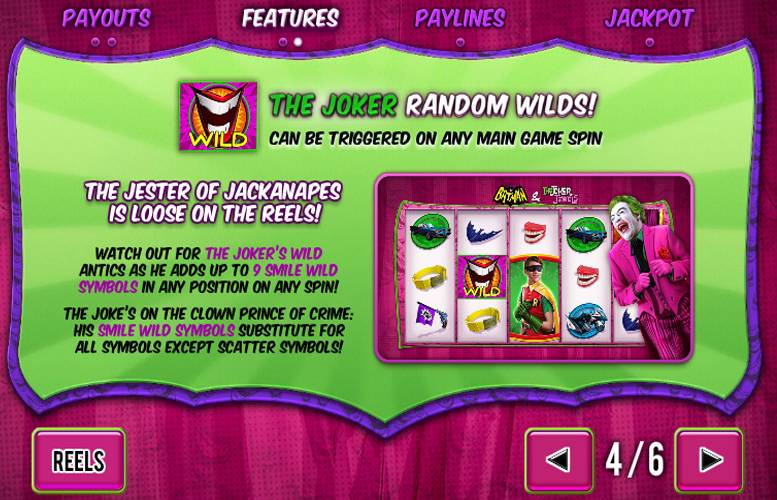 When active, the Joker appears and adds additional “wild” symbols to the reels. He can add up to nine symbols in any position on any spin. 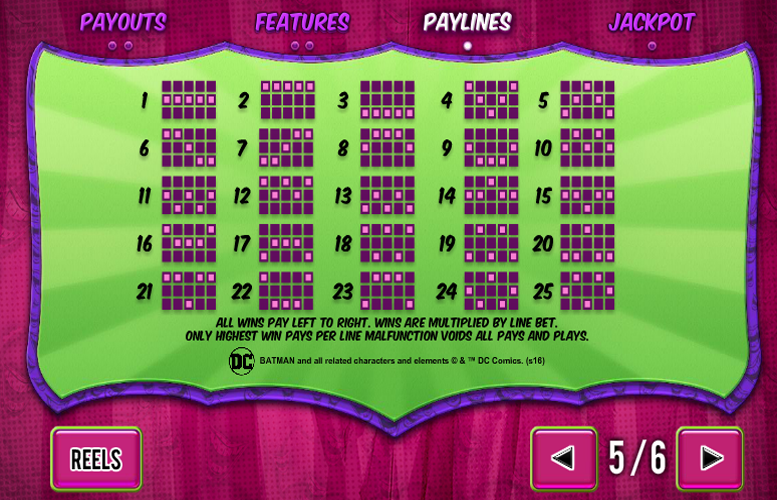 One of the best features on Batman and the Joker Jewels has got to be the progressive jackpot mode. There are four special prizes that can be won, and players are guaranteed to walk away with one of them should they trigger the mode. The progressive jackpot round can be triggered on any spin of any value. However, the higher the bet, the greater the chances are of activating the mode. Once triggered, players are presented with 20 jackpot icons. Clicking an icon will reveal one of four coloured symbols. Each of these corresponds with one of the jackpots. After a symbol has been revealed, it is collected by the player. Once the player collects all a single jackpot’s symbols, they will win that prize and be returned to the main game. Bat Bike or Bat Mobile = 100x the line bet. Joker’s Gun or Chattering Teeth = 75x the line bet. Belt or Batarang = 50x the line bet. Being as the number of lines is fixed at 25, players are only able to adjust the total bet amount. Here, the minimum value is just 25p (equates to 1p bet per line). Meanwhile, the maximum value a player can bet on every spin is £2,500. This makes every bet per line £100. Evidently, Playtech had higher rollers in mind when designing this game. 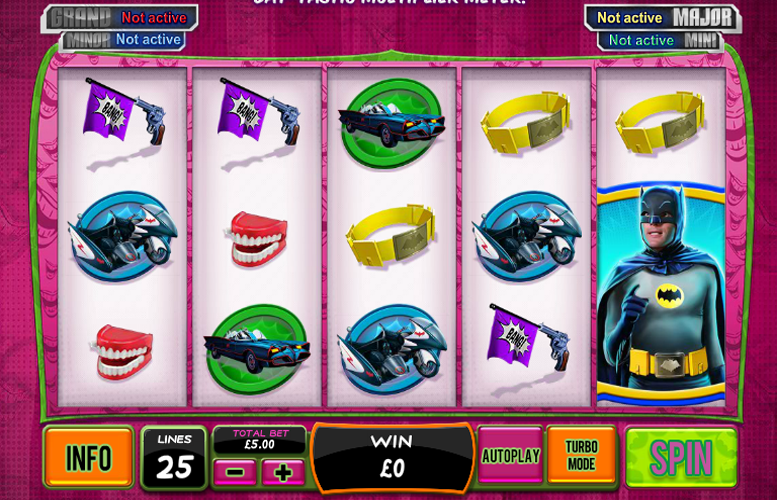 All told, Batman and the Joker Jewels is a solid addition to the Batman slot machine collection. Playtech have done a few of these style games and this one easily holds its own against the others. That said, it may hold more appeal to fans of the original material. For those not familiar with Batman’s earliest adventures, even the large main game prizes and progressive jackpot might not be enough to keep them entertained. This game has a rating of 3 / 5 with 531 total reviews by the users.